"To teach others, one must have a badge of authority; otherwise teaching becomes a mockery. A man who is himself ignorant starts out to teach others-like the blind leading the blind! Instead of doing good, such teaching does harm. After the realization of God one obtains an inner vision. Only then can one diagnose a person's spiritual malady and give instruction. 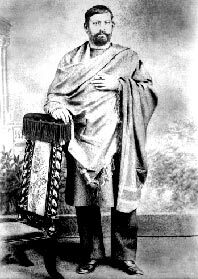 BRAHMO: "But what about our worldly duties-duties associated with our earning money, and so on?" "Karmayoga is very hard indeed. In the Kaliyuga it is extremely difficult to perform the rites enjoined in the scriptures. Nowadays man's life is centred on food alone. He cannot perform many scriptural rites. Suppose a man is laid up with fever. If you attempt a slow cure with the old-fashioned indigenous remedies, before long his life may be snuffed out. He can't stand much delay. Nowadays the drastic 'D Gupta' mixture is appropriate. In the Kaliyuga the best way is bhaktiyoga, the path of devotion-singing the praises of the Lord, and prayer. The path of devotion alone is the religion for this age. (To the Brahmo devotees) Yours also is the path of devotion. Blessed you are indeed that you chant the name of Hari and sing the Divine Mother's glories. I like your attitude. You don't call the world a dream like the non-dualists. You are not Brahmajnanis like them; you are bhaktas, lovers of God. That you speak of Him as a Person is also good. You are devotees. You will certainly realize Him if you call on Him with sincerity and earnestness." The boat cast anchor at Kayalaghat and the passengers prepared to disembark. On coming outside they noticed that the full moon was up. The trees, the buildings, and the boats on the Ganges were bathed in its mellow light. A carriage was hailed for the Master, and M. and a few devotees got in with him. The Master asked for Keshab. 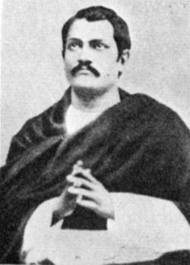 Presently the latter arrived and inquired about the arrangements made for the Master's return to Dakshineswar. 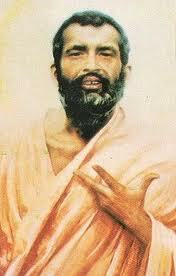 Then he bowed low and took leave of Sri Ramakrishna. As the carriage went along, the Master put his head out of the window and looked with childlike enjoyment, at the people, the vehicles, the horses, and the streets, all flooded with moonlight. Now and then he heard European ladies singing at the piano. He was in a very happy mood.